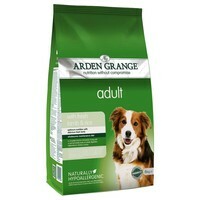 Arden Grange Adult Dog Food (Lamb & Rice) is a complete and wholesome diet suitable for all breeds of dog with normal activity levels. Containing meadow reared lamb as the primary source of protein as it is both palatable and easily digestible, this delicious Arden Grange recipe is particularly suitable for dogs with a sensitive digestion. It is also frequently suited to dogs with an intolerance or allergy to chicken protein. This particular food has better ratings at dog food analysis sites than majority of other leading brands! Yet, still great price. My dogs love it and despite having very sensitive stomachs, they have never had any problems since put on AG Lamb&Rice. Great! Would recomend to everybody. This food is very good for my 16 year old dog who has a sensitive stomach and is allergic to chicken. This is the only food I have found that keeps weight on my 4 year old Lab, he is prone to colitis but this suits him really well.Good price for a good food!